Is anyone aware of a decent flashcard program that has a decent AI and learning system that is free? 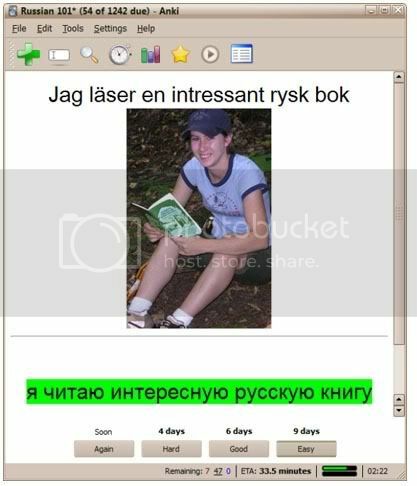 With my current Russian course, I have about 500+ words which I need to constantly review, but I am using a program called "MemoryLifter (v2.2)". It's decent, but the way they set it up is a little weird. It's either multiple choice or fill in the blank and you have to set it up yourself (which actually, I don't mind). The biggest problem for me is the words that I missed they don't weight so I focus more on them enough. This one is free. You can download Russian files from their site free or make you own files. No audio. I can't even figure out how to work the one you use! I really want to recommend Anki. Again free, easy to use and has nice looking user interface. You can download an existing database of words, or enter your own words or phrases. You can add pictures and sounds, and you get corrected as you type in the sentence or word. Green for right and red for wrong. Anki uses "spaced repetition" so it only shows you the cards that you haven't learnt yet. Those cards that you have learnt are scheduled for repetition in some weeks or months. You can see graphics and statistics of your progress. I saw this post and I just had to register in order to reply! I'm thrilled to hear I wasn't alone in wanting such a program! I've not been very happy with what "flashcard" programs I could find (haven't tried those mentioned above though), and really wanted something online. So as crazy as it sounds I spent all of last week writing my own (literally spent my entire weeks vacation coding). I actually bought a web address for it (drillvocab.com) as I was hoping to eventually share it with others. Anyhow, it's a bit premature (there are many "features" available that don't even work right now! ), but seeing as I didn't sleep all of last week because I too wanted this, I thought I would share it. If you do take a look, I would love feedback! Currently it will always start with the easiest (i.e. most frequent) words, so I know it is not incredibly useful just yet. Also, I've only input definitions for the first 150 words at this point, but I have 5000 loaded into a custom dictionary... so eventually! Anyhow, I just wanted to share that! And good luck with the programs listed above... could you let us know if you find a particularly good one?